Today Thursday, October 5th, is the anniversary of the RUC attack on a Civil Rights March at Duke Street in Derry in 1968. The image of RUC officers batoning peaceful protestors, and of one senior officer using a blackthorn stick to viciously beat a protestor to the ground, are now part of the televisual history of that period. 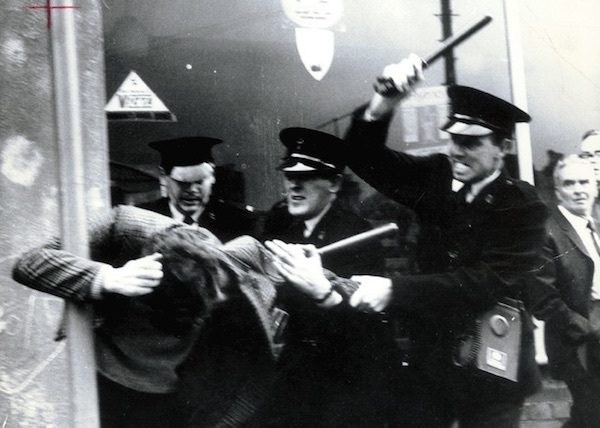 It was for many the moment in which the northern Unionist state decided that state violence was the appropriate response to the peaceful and non-violent protests for civil rights. In the years that followed rubber bullets, plastic bullets, CS and CR gas, along with batons, and then lead bullets, became part of the armoury of the British Army and RUC. Baton wielding riot clad RUC men beating citizens to the ground was a familiar image. Protest marches and funerals were regularly the target for such state assaults. Rubber and plastic bullets were used extensively. Up to 1981 almost 100,000 such bullets were fired. 17 people, 8 of whom were children, and a mother of three young children, were killed and hundreds of people continue to bear the scars of those attacks. The television news images last Sunday of Spanish Civil Guards firing plastic bullets at Catalan citizens trying to vote, and the violent scenes of heavily armoured police batoning defenceless and peaceful citizens - some of them lying on the ground, many of them women, some elderly - were a stark reminder of that northern experience. A Sinn Fein delegation of Senators, TDs and MEPs, including Martina Anderson, were in Catalonia acting as international observers to the referendum. They witnessed at first hand the beatings and assaults on ordinary citizens and the efforts of the Spanish government to prevent the referendum vote from taking place. Civil Guards were filmed smashing their way into polling stations, beating the young and the old, and violently seizing ballot boxes. Over 800 people were injured in what Spanish Prime Minister Rajoy described as an ‘appropriate response’. The response of the people of Catalonia to the violence of the Spanish state was astonishing and I want to commend their bravery. Sunday’s referendum was the culmination of almost two decades of Catalonian efforts to achieve greater autonomy within Spain. Catalan leaders have tried to engage successive Spanish governments in a dialogue on this but their efforts have been largely spurned. They have been frustrated at every turn by an intransigent central government and the courts. Evidence of that can be found in the prosecution of the Speaker of the Catalan Parliament for allowing a debate and vote in the Catalan Parliament on holding the independence referendum. And a former President and two former Ministers are also being prosecuted for organising a non-binding referendum on independence in 2014. Despite the intimidation and violence of the Civil Guard, which saw almost a thousand people injured, over 2.2 million people braved the batons and plastic bullets and voted out of an electorate of 5.3 million. More than three quarters of a million votes could not be counted because polling stations were forcibly closed and ballot boxes lifted by the Spanish police. At its conclusion 90% of those who voted had backed independence. On Tuesday tens of thousands of workers brought Catalonia to a standstill in a general strike called to protest against the violence of the Spanish police, the intransigence of the Spanish government, and the demand for independence. I raised the Catalan situation with the Taoiseach Leo Varadkar in the Dail on Tuesday. The Fine Gael party is a sister party of the Spanish Prime Minister Rajoy’s Peoples Party. On that basis I urged the Taoiseach to use his influence and connections with the Peoples Party to encourage dialogue as a way of finding a resolution to the current crisis. I also believe that the international community, especially the European Union, has an obligation to ensure that Catalonia can pursue the course of self-determination without fear of suppression. Not surprisingly the Spanish government is hiding its inflexibility and refusal to talk behind the claim that Catalonia is an internal matter for Spain. This is exactly the same excuse which British governments employed to refuse international interest or involvement in resolving the conflict in the North. It was only when these matters were internationalised that remedies and solutions were found and progress was made. The key to resolving this significant constitutional crisis is for the Spanish government to agree to sit down and talk with the leaders of Catalonia. President Puigdemont of Catalan has already stated his willingness to enter negotiations. Regrettably, thus far Prime Minister Rajoy appears determined to deepen the crisis by remaining stubbornly uncompromising. If he chooses to arrest senior Catalan politicians or to introduce direct rule by Madrid these moves will only deepen the crisis. In the next few days the Catalan Parliament will meet to discuss the results of the referendum and its next steps. Sinn Fein supports the right of the people of Catalonia to self-determination and we will continue to support them as they seek to advance their goal.